Base - 13 1/2" x 5" x 33 1/2" high. 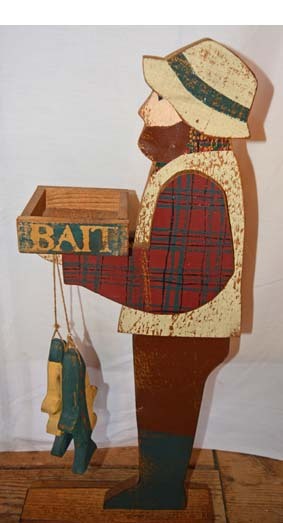 The Folk Art Fisherman is not old, but I thought it would be a fun piece for your cabin. He is very "Maine" with his plaid shirt and beard and fisherman's hat, not to mention his "catch of the day". The bait box can be decorated seasonally, and he also can be used to decorate outdoors, weather permitting, in a protected area. This would make a perfect gift for anyone interested in fishing.